This April 15th – 21st is Chiropractic Awareness Week. The British Chiropractic Association (BCA) are encouraging parents to straighten out their approach to back care as new consumer research shows that 79%* of the UK population has suffered from back / neck pain at some point in their lives – 61%* of those being parents. The research also shows that over half (55%*) of parents’ back or neck pain has prevented them from lifting or carrying their child. 40%* of women said their back or neck pain had prevented them from carrying their child’s car seat or carry basket and 40%* of men said that back or neck pain had prevented them from playing with their child. The picture above is taken from a Voltarol advert, it implies that by using the cream when you have back pain, straight away you can leap around and lift your child no problem! This is not at all true you should always listen to your body, pain tells you something isn't right and that is the last thing I would recommend my patients do, as they risk worsening the problem and do see a lot of patients in a lot of pain because they thought they could carry on doing things as normal. Instead keep moving little and often, have a gentle stretch, and don't lift anything heavy, certainly not at such a distance away from the body as shown above! Bedside cot, easier for night feeds, and with an adjustable height base it can be used as a cot in the babies nursery! Find a cot which has sides that drop down to several levels, and a base that moves up and down. The less you have to lift and lean over to put your child into the cot, the better. A 5kg weight at your chest equates to five times that amount at arms length! So when placing your child in the cot, keep them as close as possible to you. Remember, you will be doing this thousands of times! Fix the cot to the floor or wall as toddlers can rock the cot causing it to tip, and either injure your child or you as you run to stop it falling. Whether breast or bottle feeding, find a comfortable posture. Your arms should not be bearing the baby’s weight, so use pillows to support your arms and shoulders. It is not uncommon for mums and dads to get neck strain from checking that the baby is feeding properly. Keep looking up to give the neck a rest, or if it is really painful try using a mirror positioned so you can see. Alternating feeding sides is a good idea when bottle feeding, as it evenly spreads any strain. Feeding a child in a high chair can place strain on your back. Sit as close as possible in front of your child and adjust the height of the chair so that you are not leaning too high or too low. A pushchair or pram with adjustable height settings is ideal, as it can be moved to suit your own height, and that of anyone else who will be pushing it. You should be able to walk upright with a straight spine and hands resting at a comfortable height. A pram or pushchair must be one that is easy for you to put up and collapse. Try them out to check! You don’t want the mechanism to be too stiff or complicated to work or require you to press down hard with one foot at the back, as this is not good for your back. Check you can safely carry it once collapsed; some people find that the shape a pushchair collapses down to is in itself, difficult to manoeuvre! Carrying your baby as close as possible to your centre of gravity, across your back or front is best. 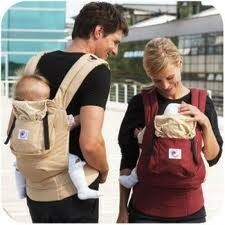 A carrier/sling or papoose is a good option. 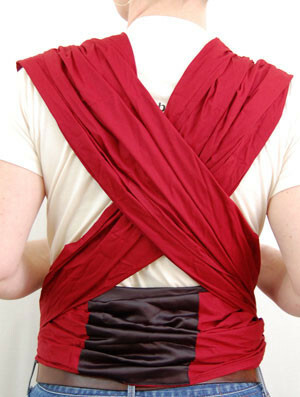 Select a carrier that ‘criss-crosses’ at the back, so baby’s weight is distributed more evenly, as opposed to across one shoulder. If carrying your baby without a sling or carrier or using one that is one sided, keep the baby’s weight close to your body and to your hip, with your spine straight, Swap sides regularly. For carrying a long way, a backpack carrier is best as it distributes the weight evenly across your back. 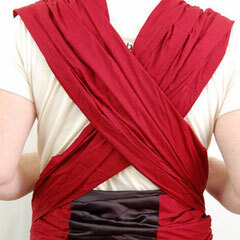 Make sure you have the shoulder straps firmly tightened and click the waist strap into place. There are carriers that take the weight onto the hips, but make sure you use them with your spine straight. Encouraging toddlers to do as much as possible for themselves as appropriate, such as getting into the car seat, will save your back a lot of stress! If you’re carrying the baby in a chair, rest the chair on the edge of the car seat before bending to manoeuvre it into position within the car, keeping your knees bent and back straight. Don’t try to reach out too early and avoid bending from the waist by using your knees and hips. Get down to your child’s level, rather than bending over. If sitting on the floor to play with your baby/toddler, try sitting on a cushion to help support your back and keep your back straight. Don’t bend to pick up toys, bend your knees. Watch your child and observe the natural squatting posture they use to pick things up! The fitter you are and the more muscle tone you have the less likely you are to injure yourself. Talk to your chiropractor, GP or other healthcare provider for advice on exercises to develop your core strength. Use a rucksack style bag is best as you can spread the weight evenly across your back. Check the straps are tightened so that the load is held against your back. Avoid high heels and wear comfortable, supportive shoes. If you have children already, it can be difficult if they need lifting and carrying. Always lift with your spine straight and bend knees to avoid leaning, stretching or bending. Simple activities such as stretching and shoulder shrugging can all help to keep your back in line. Do not sit for prolonged periods, take a regular break and, when sitting, let the seat take your weight and, if possible, keep as much of your body in contact with the chair so that your whole body is supported. Knees should be lower than your hips.